Well – the time to shop for the special men in your life is quickly running out. 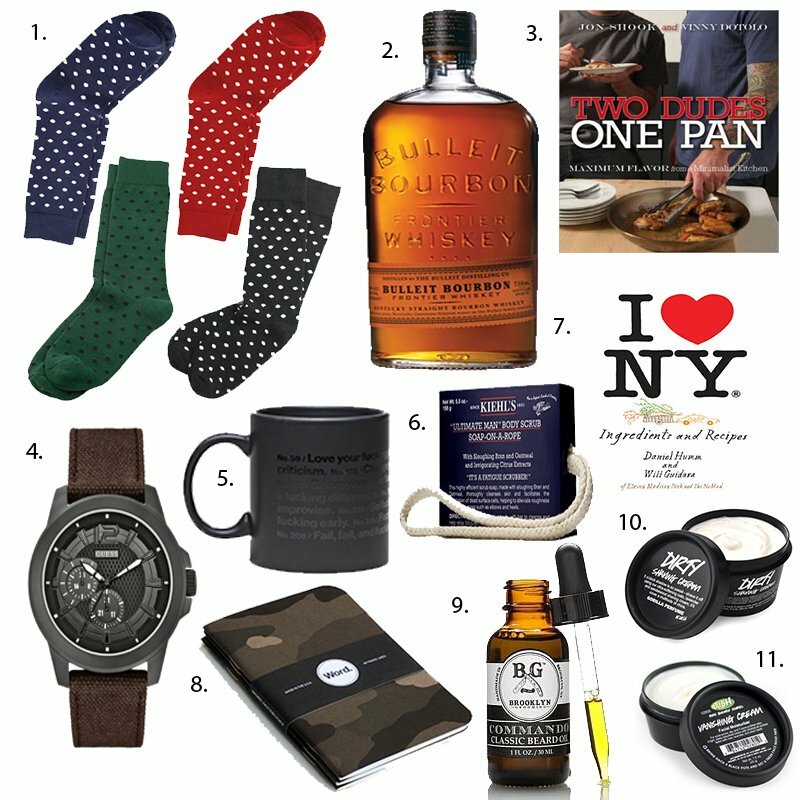 So today I’m here to help, i’ve scoured the inter webs and compiled a list of several of my favorite items, and a handful of sure fire gift ideas for those hard to shop for guys out there. Links to everything pictured is below! 1. Richer Poorer Socks – I came home to a surprise package from these guys in the mail a few weeks back, and can’t get enough of them. Super comfortable and plenty of fun. 2. Bulleit Bourbon – here’s the Kentucky coming out in me, bourbon is great any time of year, but a definite winner this time of year. Think of all the hot toddies your guy will be making you after you get him a bottle of his favorite bourbon. My favorite? Bulleit, the taste is different, but incredible smooth. If you’re not sure what his favorite bourbon is take him on the Urban Bourbon Trail to find out! 3. Two Dudes, One Pan – Nice play on words, don’t you think? Bought this as a gift last year, and I was lucky enough to be able to cook with the guy I got it for. The recipes are INCREDIBLE and not too complicated. 4. GUESS Masculine Active Sport Watch – The mix of canvas, leather and ion plated materials gives you a modern look that takes you from the office to the outdoors. 5. Advice Coffee Mug – If your guy is like me, he couldn’t get his day started without coffee. So start off his day with a cup of hot joe in an inspiring coffee mug. 6. “Ultimate Man” Body Scrub Soap-On-A-Rope Limited Edition – Made with natural oat bran, oat kernel and pumice to help alleviate roughness on tougher areas such as elbows and heels to keep his body baby bottom smooth in the winter. 7. I Love New York: Ingredients and Recipes – From the acclaimed team behind Manhattan’s three-Michelin-starred Eleven Madison Park restaurant comes this deluxe cookbook showcasing the foods, ingredients, and culinary history of New York. 8. Word. Notebooks – Their unique bullet point system will help him keep track of all the little things he’s got going on YOUR to-do list. Sold in packs of three, each 48-page pocket notebook is ideal for keeping tabs on what you’ve given him to get done. 9. Commando Beard Oil – Exposure to the elements, smoke, airborne particulate and even daily face-washing can strip the beard’s bristles of their natural protective cuticle, rendering the already-coarse hair even more brittle, dry and scratchy. So if your guy kept his “Movember” beard like I did, he definitely needs this. 10. Dirty Shaving Cream – Or if you’re one that doesn’t enjoy smooching when there’s a hairy, scratchy bearded face to contend with your dirty boy should use this softening shaving cream to help the razor glide over his skin and leave his chin looking sharp. 11. Vanishing Cream – Keeping his skin hydrated this year is especially important, with Vanishing Cream from Lush he’ll not even remember putting it on that morning because it’s literally that light. This has been my go-to moisturizer for years. Hopefully this guide makes your shopping easier! Feel free to e-mail me or leave a comment if you have any questions, or want to let me know what your go-to gift for the guys in your life is! Happy Shopping, and check out IFB for gift giving guides for all your loved ones.